If the solar system has an underachiever, it has to be Venus. The planet is about the same size as Earth; it sits closer to the sun than we do, but not by much  67 million miles, compared with 93 million miles (or 108 million km vs. 150 million km). Its year, at 243 days, is not even all that different from our standard 365-day model. The big distinction is the temperature. A hot day on Earth is perhaps 85°F (30°C); a simply average day on Venus is 800°F (427°C). That's a little too toasty for life  at least as we know it. But if new European Space Agency (ESA) findings from the Venus Express spacecraft are correct, it looks as if Venus coulda been a contender. The reason: it once had water. The relatively small distance that separates Venus' and Earth's proximity to the sun makes a very big difference in temperature. Light falls off exponentially with distance, so a planet that is, say, twice as close to the sun as Earth is would get much more than twice the solar energy. Making problems much worse for Venus, its atmosphere is a thermal quilt, 93 times denser than Earth's and made up mostly of carbon dioxide and sulfur dioxide. That leads to a runaway greenhouse effect  and that, in turn, makes it awfully hard to hold on to the oceans and seas that served as the incubators for all terrestrial life. If you could collect all of the water on Earth and distribute it evenly around the planet, it would make a global ocean 1.9 miles (3 km) deep. Do the same with the trace amounts of water in the Venusian atmosphere, and the depth of your ocean would be just 1.8 in. (3 cm). One of the things the Venus Express  which left Earth in November 2005 and entered Venusian orbit in May 2006  was to determine was whether at any point in the planet's 4.5 billionyear history it might have been a little wetter and thus a little more hospitable to life. To do this, the spacecraft recently began taking measurements of some of the trace gasses being given off by Venus, looking specifically for hydrogen and oxygen. If Venus was once wet, the ESA scientists knew, not only would the planet's heat cause any liquid water to flash evaporate into the atmosphere, but also the ultraviolet radiation streaming in from the sun would cause the H2O molecules to break down into individual atoms  two of hydrogen and one of oxygen. Those atoms could simply drift from the planet into space. 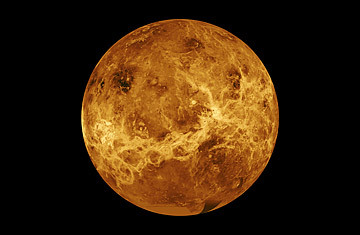 If Venus is giving off twice as much trace hydrogen as oxygen, therefore, its source would clearly be water. And if it's consistently doing so after so many billions of years, that water may once have been plentiful. That H2O signature, according to an ESA announcement on June 24, is precisely what the spacecraft found. What's more, it detected comparatively high levels of the isotope deuterium in Venus' upper atmosphere. Deuterium is a heavier form of hydrogen that is common in Earth's oceans and that would have too much mass to escape Venus' atmosphere. The presence of the isotope is one more sign that Venus was once a watery world. "Everything points to there being large amounts of water in the past," says Colin Wilson, a professor of oceanic, atmospheric and planetary physics at Oxford University and a member of the Venus Express science team. Even in Venus' wetter days, the planet's heat would have made it difficult for water to exist in liquid form. But the ESA does not rule out the possibility that Venus had a brief habitable period before the temperature climbed too high, with standing water on the surface and perhaps even oceans  just as Mars is now known to have had a long oceanic period before it too lost most of its water to space. The fact that the planetary neighbors on either side of us had such promising beginnings and came to such desolate ends is one more reminder of the improbable balance of temperature, chemistry, gravity and more that the Earth had to get just right to become the global garden it is. It's one more reminder, too, of how important it is that we tend that garden well.